Champion Marco Attard and Alexander Sims of Ecurie Ecosse Powered by Black Bull team won the second race of the British GT season at Rockingham. The drivers of the BMW Z4 GT3 clinched their first victory in the season in front of Oman Racing Team/Motorbase Performance Aston Martin Vantages with Ahmad Al Harthy and Daniel Lloyd on second and Liam Griffin and Rory Butcher on third. 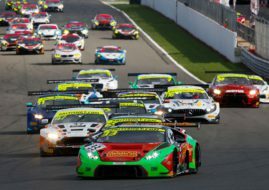 In the opening rounds of the race, Attard defended his lead even though he had to serve a five-second penalty that he carried over from the previous race at Oulton Park. The experienced Scot stayed in charge until Sims took the reigns of the car in the 33rd lap. After that, Sims had a small deficit behind Lloyd but he persisted and finally used a small mistake from Lloyd to overtake him and go straight to the top. Ecurie Ecosse’s am-driver also survived late safety car deployment when he was almost ten seconds clear of Lloyd. Lewis Plato and Alastair McKinnon took home an excellent fourth in the RAM Racing Mercedes, with Matt Bell and Derek Johnston’s TF Sport Aston Martin fifth. In the GT4 class, Beechdean AMR’s pair of Jamie Chadwick and Ross Gunn was absolutely dominant having a lead of over a minute over a chasing group. Academy Motorsports’ Will Moore and Dennis Strandberg finished second after GPRM’s Toyota with Richard Williams and Stefan Hodgetts hit trouble. JWB Motorport’s pair of Jake Giddings and Kieran Griffin ranked third leading to an Aston Martin-dominated podium.